One day Jesus told a story about a wedding feast. Let's learn something about Jewish traditions before we hear the story. The Jewish marriage took place in three stages over a long period of time. When the couple was still very young, an Engagement was arranged by the parents, sometimes with the help of a "matchmaker". Second, there was a Betrothal ceremony held at the bride's house. The couple exchanged vows and the groom gave the bride presents. This period lasted for a year or two, but the bride continued to live with her parents. During this time the bride was said to be "betrothed" or "espoused" to the young man. The Marriage Supper came next. It usually happened at night. The groom and his friends came to the bride's house. She would be wearing a thick veil. She and her friends would accompany the groom and his friends to his father's house or maybe a larger hall where the festivities would take place. A contract was signed. The bride and groom would spend time together, then the bride would remain by herself for seven days. At the end of the week, the bride would return to the group, remove her veil so that everyone could see her. If the young woman had never been married, the feast would last for seven days. If she were a widow remarrying, it would last for three days. 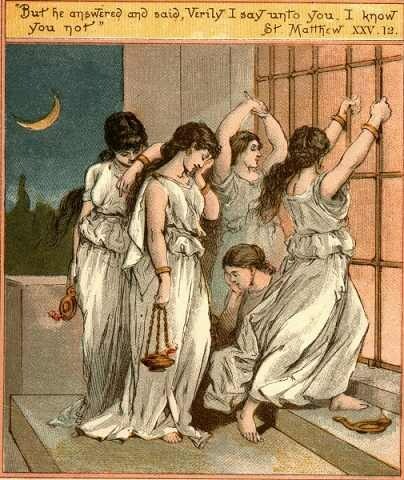 In the story Jesus told, the ten virgins were waiting for the bridegroom to come. Possibly they were already at the hall where the bridegroom was bringing his bride. It was nighttime and they all had lamps with oil in them, and the lamps were burning brightly. They waited and waited. Still the wedding party had not arrived. As it got later, they began to get drowsy, and one by one they fell asleep. Then they heard someone calling, "Here's the bridegroom! Come out to meet him." They began to get up, but some of the lamps began going out. Five of the girls were prepared for just such an event. They had planned ahead and anticipated the delay. They had extra oil to add to their lamps. They were wise to make this preparation. The five foolish girls had no extra oil. They wanted to borrow some from the wise girls, but they refused. They said there might not be enough for all of them. They urged the girls to go and buy some oil from someone who had it for sale. The girls left to go find a merchant who would sell them oil. 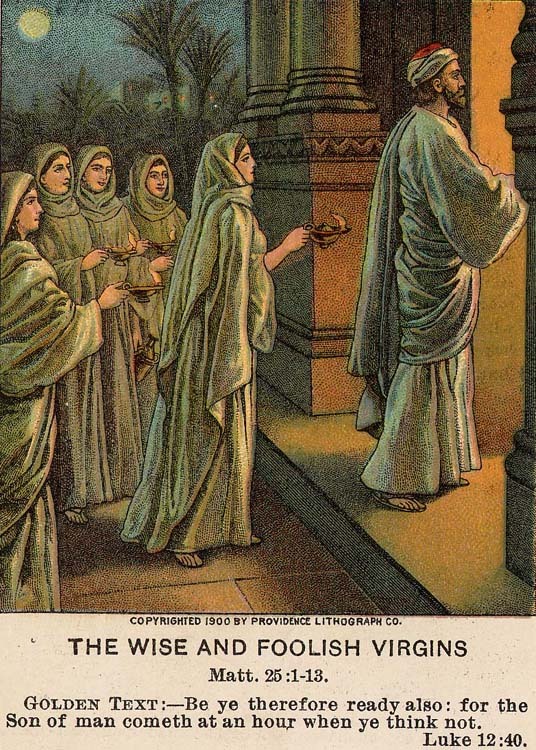 While they were gone, the bridegroom arrived and the five wise girls and the rest of the wedding party went inside. The door was shut. The five foolish girls came back. They shouted for someone to open the door for them, but sadly there was no way for them to enter. The bridegroom replied, "I tell you the truth. I don't know you." There are many ideas about the meaning of this parable. But one idea seems to be very clear; we need to live our lives in such a way that we are always ready for the Lord's return or for the end of our lives. This parable teaches us to always be prepared. The foolish girls brought oil in their lamps, but they didn't think ahead and bring extra oil. Are you going to have a test at school? Don't wait until the last minute to prepare for it. Study ahead of time and you won't have to "cram" to get the knowledge in your head. Do you have a memory verse to learn? Don't delay studying until the morning you are recite it. Work on it every day, and it will become a part of you. You may even be able to recall it years later! English Bible Activities Select story #228 in the list for activities to accompany this Bible story. Spanish Bible Activities Select story #228 in the list for activities to accompany this Bible story. Press "Go" to search for books about The Parable of the Ten Virgins. First thing to understand this parable you need the spirit of the Living God. 2011-9-10 I really enjoy this site and use many printables for our Superchurch class on Sundays! Thank You for having this available to use as a valuable resource. The grace of the lord be upon this world. May the lord bless the initiatives to this cite. I found wisdom and understanding of the word of God.I found my beautiful short but powerful memory verse: Luke 12:40" You also must be ready for the son of man will come an hour while you do not expect him"
This page displayed 172,758 times.